Mark Gladwin, MD, and his research team have discovered a possible antidote to carbon monoxide poisoning. The toxic, odorless and colorless gas results in about 50,000 emergency department visits annually in the United States alone. It is one of the nation’s leading causes of poisoning death. Dr. Gladwin is the Jack D. Myers Professor and Chair of the University of Pittsburgh’s Department of Medicine. His ground-breaking discovery was the Dec. 7, 2016, cover story of Science Translational Medicine. Researchers in the Gladwin lab altered a human protein called neuroglobin, which is found in neuron and retinal cells. When the mutated protein was administered to eight mice who had been exposed to lethal amounts of carbon monoxide, the protein trapped the carbon monoxide and quickly removed it from intact red blood cells. Seven of those mice survived. Dr. Gladwin’s next step is to further refine the neuroglobin and test its ability to clear carbon monoxide from red blood cells, tissues, and heart and brain mitochondria within minutes. 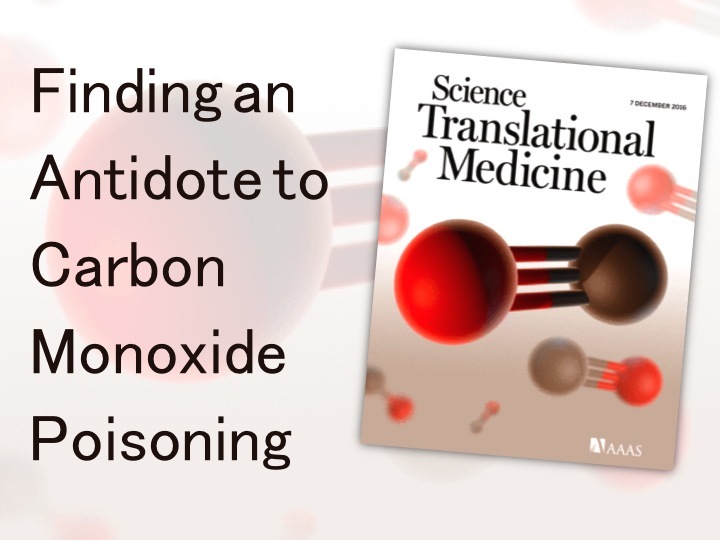 In addition to preventing carbon monoxide deaths, it is hoped that such an antidote in humans would improve a person’s long-term organ function and survival after severe poisoning. Azarov I, Wang L, Rose JJ, Xu Q, Huang XN, Belanger A, Wang Y, Guo L, Liu C, Ucer KB, McTiernan CF, O’Donnell CP, Shiva S, Tejero J, Kim-Shapiro DB, Gladwin MT. Five-coordinate H64Q neuroglobin as a ligand-trap antidote for carbon monoxide poisoning. Sci Transl Med. 2016 Dec 7; 8(368):368ra173.